Garlicky and buttery, this simple Japanese Garlic Fried Rice topped with garlic chips is a dish I have cooked many times over the years as one of my go-to rice dishes. 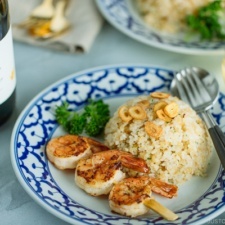 This fried rice recipe matches so well with a delicious side like succulent grilled shrimp. Japanese Garlic Fried Rice, or what we call Garlic Rice (ガーリックライス) in Japan, reminds me of my college days when I used to cook this dish over and over. I craved comfort foods like this rice dish that were easy and quick to prepare, and super flavorful and delicious. With a salad and a meat, seafood, or other protein dish on the side, it was a nice home cooked meal that kept me healthy, and kept me going on those long study nights. Now many years later, I’m still cooking this Japanese Garlic Fried Rice for my family and they love it as much as I do. Garlicky and buttery, this simple Japanese Garlic Fried Rice topped with garlic chips is full of flavors! 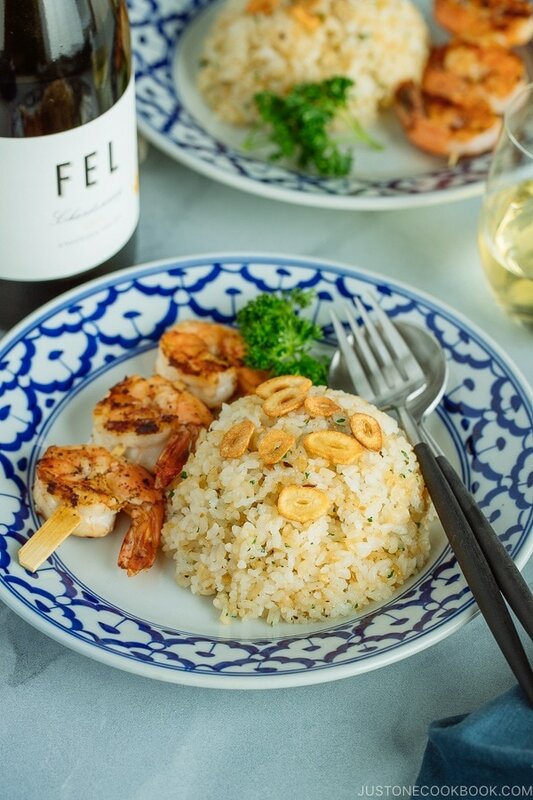 You can enjoy this fried rice recipe with many dishes including grilled shrimp. What’s in Japanese Garlic Fried Rice? As the name suggests, the rice is stir-fried in garlic flavored oil. What makes it uniquely Japanese? 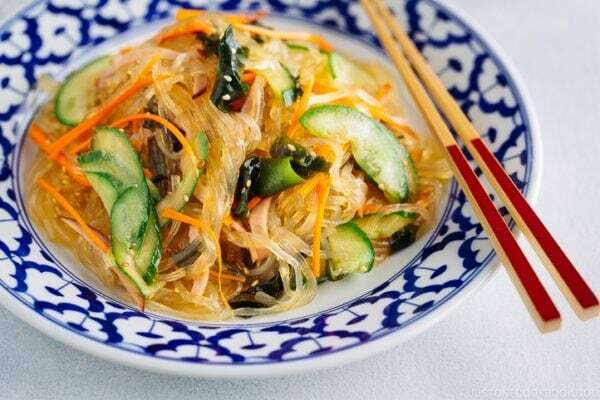 It’s the simplicity of the dish (i.e. 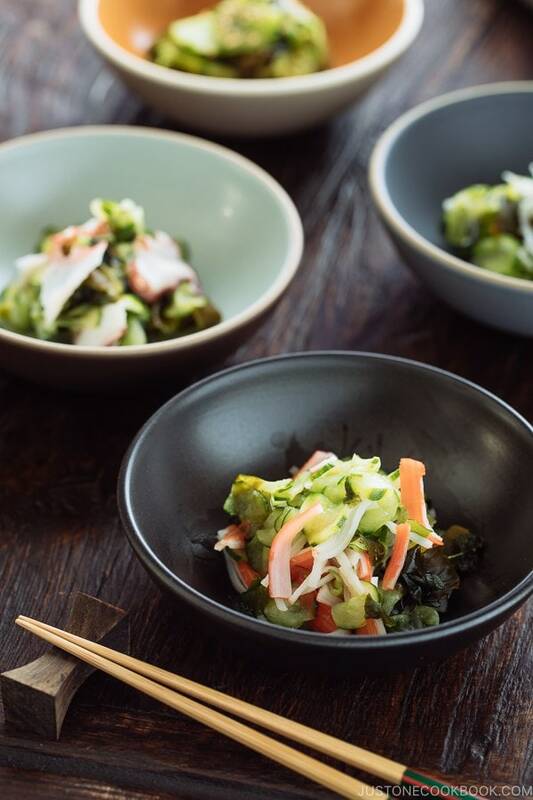 not overpowered with seasonings), as well as the use of Japanese short grain rice that is slightly stickier than other types of rice generally used in fried rice recipes. 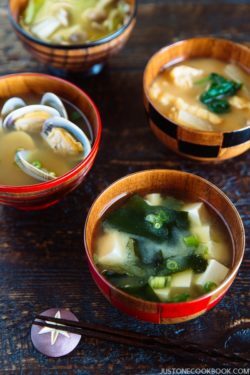 If you have been cooking Japanese recipes, you may have realized that the amount of garlic used in Japanese cooking is very small compared to other cuisines. One to two cloves of garlic is considered a “good” amount of garlic in Japanese dishes. So keep that in mind when you make this dish, especially if you’re used to using a lot of garlic in your cooking daily. It might not be “garlicky” enough for your taste so feel free to increase the amount of garlic to your liking. 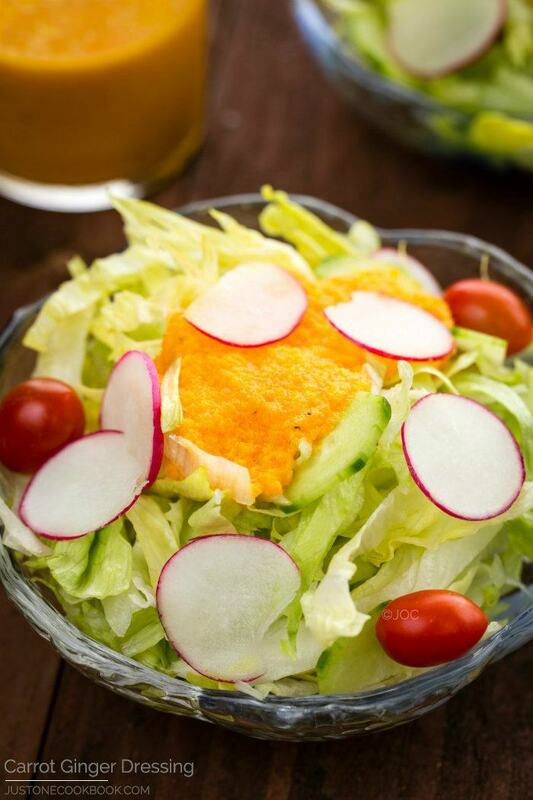 Just make sure it doesn’t overpower the side dish you plan to enjoy it with. 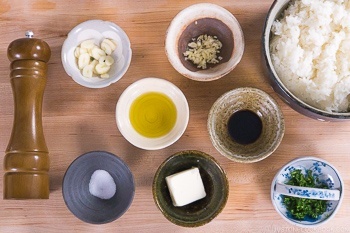 Besides garlic, other common ingredients in Japanese Garlic Fried Rice are butter and parsley. You can omit butter if you’re vegan, or use a substitute. If you don’t like parsley, you can replace it with scallions. Also, like other fried rice recipes, you can add fried eggs, but if you are going to serve this garlic rice as a side dish, I would recommend keeping it simple. The seasoning for Garlic Rice is usually just salt, black pepper, and a little drizzle of soy sauce. 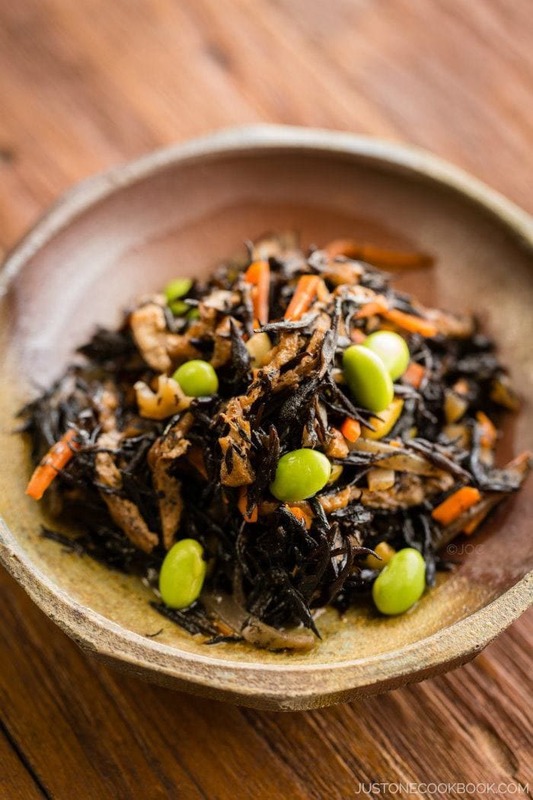 Remember that soy sauce is NOT to season the entire rice, but to add umami and char taste created from stir-frying in the hot frying pan. We previously paired FEL’s pinot noir with our Waygu post, and it was really delicious so we were excited to try their 2015 FEL Chardonnay Anderson Valley. 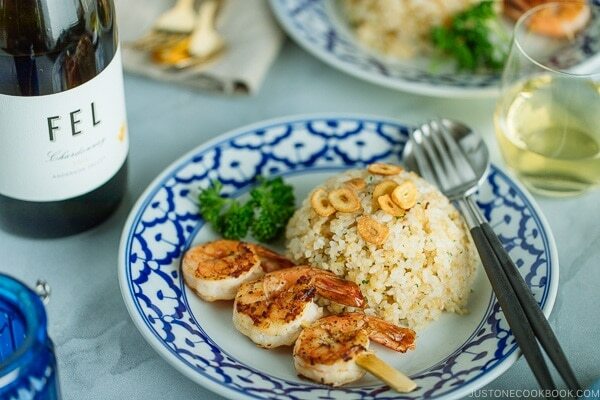 The Chardonnay didn’t disappoint and paired perfectly with the garlic fried rice and grilled shrimp. As you smell the wine, it is refreshing, pure, with a hint of sweetness. You can already dream of how delicate the wine will taste. As you take the first sip, it feels like sipping peach juice on a warm sunny day, with flavors of melons and pear fruits. The mouthfeel is light, like drinking spring water and we love how it’s not syrupy and overly sweet. Finally, it finishes with a hint of citrus with no lingering aftertaste. If you are looking for a bottle of white to pair with seafood, or to enjoy on a warm sunny day with friends, give this bottle a try. Cut half of the garlic cloves in thin rounds widthwise (so you see a hole in the center) and mince the other half. Remove the parsley leaves from the stems and mince them. Add the olive oil in the large frying pan. Slowly fry the thinly sliced garlic pieces until golden brown. If you add the garlic slices in hot oil, they would burn too fast and you may end up with burnt garlic slices. Transfer to a dish lined with paper towel and keep the garlic infused oil in the pan. Add the minced garlic in the same pan and stir fry until golden brown and fragrant. Add in butter and swirl around to coat the pan. Then add warm steamed rice. Cold rice would take too long to warm up and the garlic would get too dark (and may burn). Break the chunk of rice to separate. 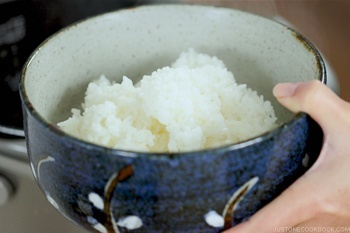 The Japanese short grain rice is stickier than other types of rice, so it’s normal that rice is stick to each other, but should not be in huge chunks. Once the garlic oil is coated with the rice, add the soy sauce and toss the fried rice. Season with kosher salt and freshly ground black pepper. Taste the rice and make sure it is seasoned to your liking. Lastly add the chopped parsley and mix all together. Put the garlic fried rice in a rice bowl, pressing gently to make sure there is no space in the bowl, and invert the rice on a serving plate. 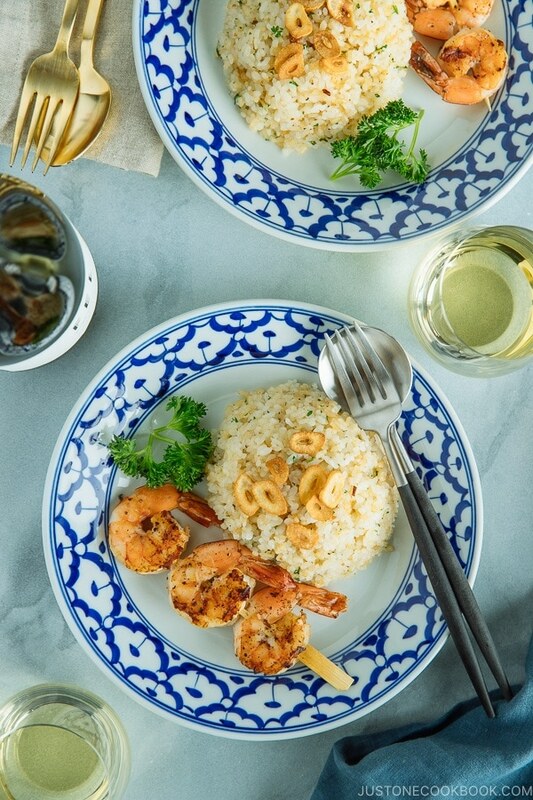 If you like to serve the garlic fried rice with grilled shrimp skewers, shell and devein the shrimp. You can keep or remove the tail. Add sake and coat well with shrimp. Skewer 3 shrimp on each damp skewer without leaving spaces. Sprinkle kosher salt and freshly ground black pepper. Lay skewers flat on a greased cast iron pan (or regular frying pan). Cook the shrimp with the lid on about 2 minutes per side or just until cooked through and no longer transparent. 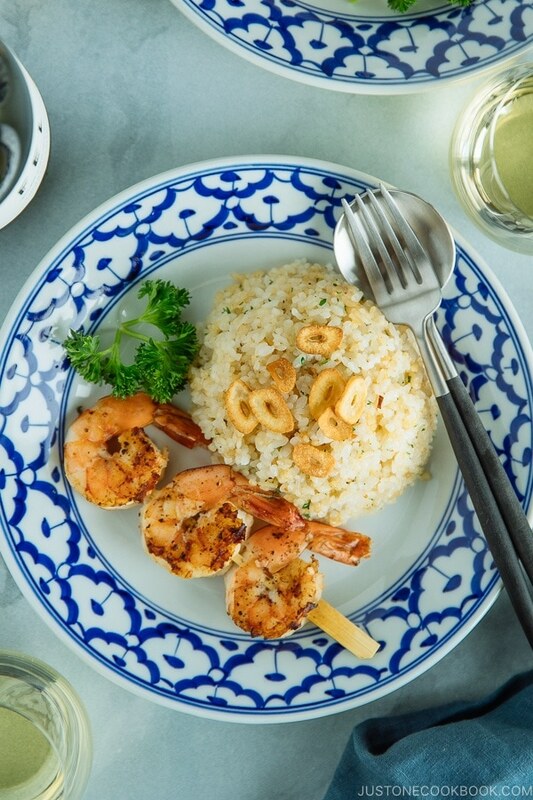 Remove the shrimp from the grill and serve with garlic fried rice. Full Disclosure: We received 2015 FEL Chardonnay Anderson Valley from Jarvis Communications free of charge to use in exchange for an honest review. We received no compensation for the wine review. As always, your videos inspire and encourage. Thank you for your welcome but unnecessary but still more welcome efforts to improve. BTW, at 2:00, there was a happy syncing of kitchen sounds and background music. Thank you for your kind comment, Robin! Hi Audrey! Thanks for noticing – at Step 1 for Grilled Shrimp Skewer section. Love your recipes! My family and I are big fans! What do you recommend on how to prepare the rice? Do you use rice that has been cooked the day before? Do you recommend a certain brand? We have been eating the Tamanishiki brand for the past couple of years. Hi Brian! Thank you so much! Tamanishiki is good, I used to eat that brand when I was in college too. Nowadays we have more choices, but I think it’s a good brand. I make it in a rice cooker. You “can” use a day old rice too, as the rice is more dehydrated and easier to separate the rice, and texture is less sticky. If you use a day old rice (and cold), make sure to warm up so the rice gets heat up fast in the frying pan. If you use cold rice, it takes to long to warm up, and meanwhile the garlic will burn. I love your new video Nami! Recipe looks great. I have a few questions: 1. Most fried rice recipes I have seen involve using rice refrigerated overnight. Would this help or hurt this recipe. 2. What kind of pan are you using? Does the design of the bottom with the little squares help? For fried rice I usually use a round bottom wok. Is the pan you are using a better choice? Thanks. 1) You can definitely use a day-old rice. Only suggestion I have is to make sure you warm up the rice before adding to the frying pan. If the rice is cold when you add to the pan, it takes forever to heat up the rice. If that happens, the garlic in the frying pan will burn by the time the rice is hot. Then it will be too bitter. Can’t wait to try this. Just happen to have some leftover short grain rice looking for a fried rice recipe. Thanks Nami! Hope all is well. Why the total time of1h15m? I read the recipe and there isn´t reason for that. Tried out this recipe last night, so simple but so delicious! Nami, this looks lovely! I love garlic but only eat it sparingly. Not a good dish with a date but a personal indulgence to enjoy! But then I pay the price later. Oh, well. Hi Chieko! I think Japanese cooking involves almost no or 1-2 cloves garlic, at most so we don’t digest too well. Whenever I go to Taiwan, I always have issue with indigested garlic in my stomach. LOL. Hahaha you’re welcome about the peas. Thank you for sharing your lovely memories and I really enjoyed your story! Looks wonderful nice and simple too thanks. I was just curious what kind of a pan you are using it looks nice and non-stick even with the rice. ああなるほど、かしこまりました！は~い、ホワイトペッパーとニンニク使うつもりです、本当にありがとうございます！ごめんなさい、日本語はまだまだですから… thank you so much for the info, I cannot wait to try the recipe!! Just a comment about Nihonjin and garlic of course I don’t know about every other parts of Japan. 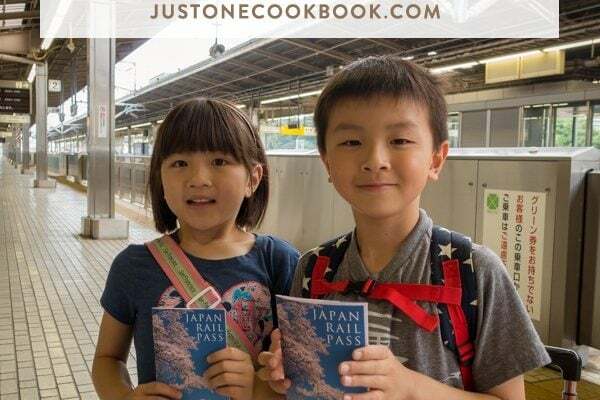 I was born and raised in Hokkaido and many of us use garlic in our cooking (not as much as Italians) and many in Yokohama as well probably from the Chinese influence. 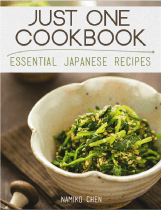 Though from seeing the many Japanese cooking recipes on the web especially the ones written in English the majority of dishes are basic city food etc. Except for you and a few others most of these English speaking or offered in English food blogs are done by non Japanese or non Asian people who understandably only seem to know about dishes they saw on TV or had when in Osaka or Tokyo etc or most what most mainstream traditional Japanese restaurants offer . I only see the same 20 dishes online same goes Korean or Chinese it seems. My point is many times a blogger will see things here in Japan and assume the entire country is the same way. Like the nonsense of how most westerners think we all eat KFC for Christmas etc. Thank you for your feedback, Kazunori-san!